When you rez Dracō, you may pay Xcredit to place X power counters on it. subroutine Trace – If successful, give the Runner 1 tag and end the run. Dracō is a card that hasn't seen a lot of love. Many corps have tried using it, and most of them have found it to be less effective than they had hoped. Part of that is due to this card being a very high-skill card to play effectively, and if played poorly it will tax the corp much more than the runner. First, Dracō has a rez cost of x+1, where x is the strength you want the ICE to be. This gives the corp an opportunity to install Dracō early, and only rez once they know the runner's rig well enough to make it an effective tax. I would caution against rezzing this ICE to a high strength (6 is my rule-of-thumb upper limit). Better choices are forcing the runner to boost Ninja or Switchblade/Dagger to 1, or 4 with Mimic, push Femme Fatale to 3 or 4, or the new GS Shrike M2 boost to 2. These are all still affordable, but taxing on the runner at minimal cost to the corp. The corp wants the runner uncomfortable enough to not want to break the sub and instead consider letting the trace fire. The trace subroutine is overall rather weak for what may have been an expensive rez, hence I recommend lower strength settings. Without Surveillance Sweep, the corp has to pay to boost the trace first. This gives the runner the chance to run click 1, and tax the corp. This is one of the more interesting situations, where how much the corp pays hints at how badly they want this run to end. A high trace will likely be taken with some satisfaction that for 1 click and a tag, the runner effectively Vamp'd the corp, and got a signal that the corp has a strong interest in that server. The corp can send false signals, of course, but at the cost of more credits. Again, this is a reason not to invest heavily in rezzing for a high strength, and instead make it as awkward as possible for the runner to break while still making it cheap for the corp. My advice for traces is to treat it a bit like a psi game, and boost 0-2 credits as an added tax on the runner. Cards that only help a player when they are already winning are very difficult to see great advantage in. Corporate War is a similar card, where it is only helpful when the corp has an abundance of cash, and actively hurts them if they are behind. Dracō can be seen to have the same defect. Inflated rez costs to fire a trace that the runner beats for 1-2 credits feel weak for a the card slot. Boosting the trace can become costly, even 1 credit boost makes this card like an anti-Pop-up Window. Dracō is closer to an annoying stumbling block for the runner than a real obstacle for entry into a server, and if the corp falls behind on credits to the runner, then it can hurt more than it helps. 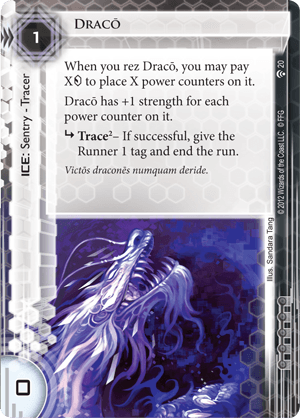 While writing this review, Dracō is the oldest card to not having one. Let's fix that. Dracō was considered as a nice little ice back in the day, when there were not so much choice, but it rarely sees play nowadays. The effect of its trace, combining a tag and an "end the run" is quite neat, and granted the Runner has no link, it offers a nice rez/tax ratio as long as he or she didn't drop its killer. Its "when rezzing" ability allow this tax to be kept effective, but knowing the most common killer played, 5 to rez is quite expansive for a not-very-frightening sentry. I mean, it hardly acts as a gearcheck like some other sentries which may let Runners pass on naked facecheck, but keep them away afterward. Some may think Surveillance Sweep could replenish it a little, but if you seek for such an effect, News Hound seems like a better candidate : just one more credit, a better trace value and out of Mimic reach from the start.